Myrtle Beach, otherwise known as the Grand Strand is a popular vacation destination in South Carolina attracting over 14 million visitors annually. Its 60 miles of wide open beaches make Myrtle Beach a favorable choice for southerners, “snowbirds” and the spring break crowd. In addition, Myrtle Beach has made a name with the golfing community offering over 100 destinations to improve that golf swing and over 40 challenging miniature golf courses for the entire family. Shopping fanatics will love the area’s widely renowned outlet-style shopping; children will enjoy the local amusement and water parks; and there’s no getting around the cuisine with over 1,900 restaurants and eateries. Travelers to the crescent-shaped Myrtle Beach didn’t always come in droves – they came in the form of Spaniards from Hispaniola in the 1500’s and formed a settlement 30 miles to the south. It wasn’t until the late 1800’s and early 1900’s when people began to make Myrtle Beach their permanent residence. Few vacationed in the area as it was rustic and undeveloped but soon the word spread of fabulous Atlantic views, wide open beaches and picturesque panoramic views. Today, Myrtle Beach has become synonymous with vacations. 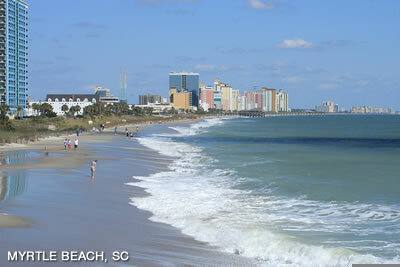 On the beach, off, land or sea Myrtle Beach provides a wide range of activities and attractions. If you take to the waters there is sailing charters and excursions that take you alongside dolphins. Jet-ski, kayak and boat rentals will take you to the back bays and historic marshes. There’s deep-sea, ocean and bay fishing ; for the adventuresome - scuba diving, windsurfing and parasailing. Take a shuttle to and from your hotel or vacation rental to Myrtle Beach casino cruise ships with Vegas-style gambling, fine dining and entertainment. Inland, find a number of award winning annual festivals like the CanAm, Sun Fun and the Beach Boogie & BBQ Festival. There’s an IMAX 3D theater, children’s museum, the historic Battleship North Carolina, Brookgreen Gardens, and the Ripley’s Aquarium, Myrtle Beach. Furthermore, enjoy thrilling roller coasters and South Carolina’s largest ferris wheel at Family Kingdom, Myrtle Beach’s only seaside amusement and water park.For those who just can’t pass up on a good sale, there are hundreds of shopping venues from malls, factory outlets, flea markets, and specialty and boardwalk shops. Take to the stores in the Grand Strand beach communities such as Little River, Murrells Inlet, Crescent Beach and Windy Hill and find a souvenir to take home. Daytime or nighttime, enjoy the shopping and dining of the Market Common. For a little nightlife and entertainment try Broadway at the Beach with over 350 acres to shop, dine dance and play. For your favorite mall stores be sure to visit the Coastal Grand Mall. The Myrtle Beach area is home to over 100 golf courses but perhaps its second claim to fame is the abundance of miniature golf courses that dot the resort communities. Aside from being the “seaside golf capital of the world” Myrtle Beach also claims to be the “miniature golf capital of the world” with over 40 meticulously groomed and decorated courses with challenging shots, windmills, volcanoes, fountains and dinosaurs. When it’s time to step up and man up (or woman up) on a real golf course, tame the greens of world famous golf courses created by world famous architects from Arnold Palmer, Greg Norman, Robert Trent Jones and of course, Jack Nicklaus. Each course has been carefully designed to protect and preserve the areas natural beauty,habitat and wildlife.